Wei™ China Herbal Eyes Alive Cream - .5 oz. This souffle-textured eye cream combines white lotus, lily and safflower - among other traditional Chinese herbs - in a formula specially designed to address the look of crow's feet, wrinkles and the appearance of fine lines around the eye area. Ingredients: Aqua\Water, Cyclopentasiloxane, Butylene Glycol, Cetyl Dimethicone, Lauryl PEG-9 Polydimethylsiloxyethyl Dimethicone, Glycerin, Sodium Chloride, Lilium Longiflorum (Lily) Bulb Extract, Nelumbo Nucifera (Lotus) Seed Extract, Camellia Sinensis (White Tea) Leaf Extract, Morus Alba (Mulberry) Leaf Extract, Glycine Soja (Soybean) Seed Extract, Panax Quinquefolium (Ginseng) Root Extract, Bambusa Vulgaris (Bamboo) Leaf Extract, Carthamus Tinctorius (Safflower) Flower Extract, C30-45 Alkyl Cetearyl Dimethicone Crosspolymer, Methylparaben, Benzoic Acid, Parfum\Fragrance, Benzyl Benzoate, Benzyl Salicylate, Butylphenyl Methylpropional, Hexyl Cinnamal, Hydroxycitronellal, Hydroxyisohexyl 3-cyclohexene Carboxaldehyde, Geraniol, Linalool. 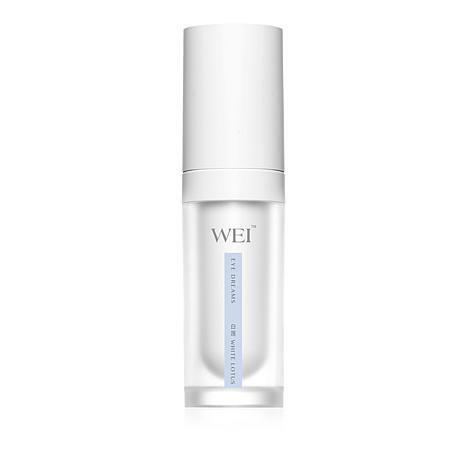 I am so happy that Wei products are back at HSN ! :) I have been using the White Lotus line for a few years now, and it is by far one of my favorite skin care lines. I love how it hydrates my eyes during the nite and leaves them looking good in the morning. I will be buying this again. Lighter feel than eye dreams and half as much as eye dreams & almost double in price. Very disappointed that eye dreams discontinued. Love wei east but getting too expensive.